| CONTACT US ~~ Serving Illinois and Indiana Since 1962! Hicksgas Simply Clear® and Complete Care ® twin systems provide uninterrupted conditioned water, 24 hours a day, seven days a week. The key to these Twin Systems is the motorized alternating valve or “MAV”. Hicksgas Twin Systems utilize 100% of the available capacity in one tank then regenerates this exhausted tank, at the same time supplying treated water from the second tank. The result is twenty-four hour, continuously treated water with no down time. 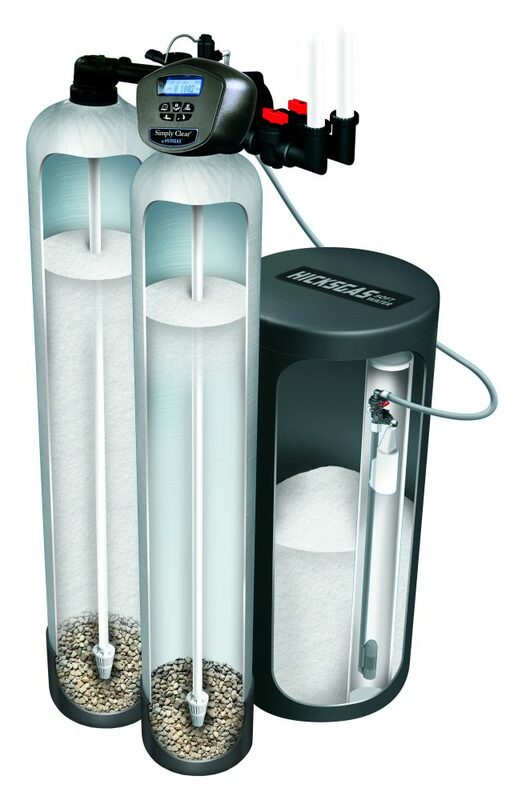 The Simply Clear Series Twin System effectively treats hard water while the Complete Care Twin, utilizing our Crystal-Right media, may be the answer for well water that contains iron, odor, or has acidic conditions. FREE WATER ANALYSIS AT YOUR HOME OR BUSINESS! and recommend the right piece of equipment to solve your water problems!